What Goes Into Your Emergency Evacuation Bag? 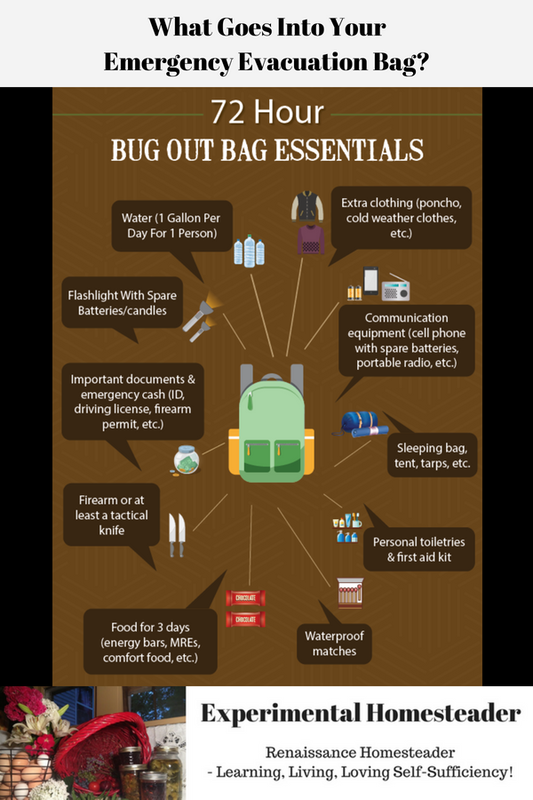 Have you ever wondered what goes into an emergency evacuation bag or as it is sometimes called, a bug out bag? In a nutshell, you need to include things that are essential for survival in an emergency situation over a three day period. 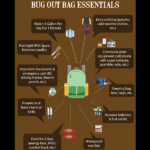 If you are new to survivalist training, you might not know what a bug out bag is. A bug out bag or as it is sometimes called, an evacuation bag, is just a bag filled with emergency supplies that you can grab and go on your way in the event of a disaster. To make an evacuation bag, simply put your emergency supplies, medicines and clothing into a heavy duty backpack or sturdy nylon bag. Supplies you will need include food that is lightweight. Freeze-dried foods or MREs work best. Make sure you pack enough food so that everyone with you has food for a minimum of three days. Water is a something you are going to need. Plan to have three days worth of water for everyone. It makes more sense to take along something to collect water in and purify it instead of trying to pack bottled water, especially if you have to escape on foot. Pack water purifying tablets or put a purifying water filter in your bug out bag. Bleach can do in a pinch, but it is harder to pack. Aside from food and water, you need a way to cook the food and boil the water. To cook the food, you need a basic camping cookware set, such as lightweight pots that can be used over campfires or on a portable camp stove. Pack enough clothes for at least two days. The clothes that you are wearing when you bug out will count as your third set. Make sure you pack long pants, long sleeved shirts and other clothing that will keep you warm. You want to do this even if it is summer. Long pants and long sleeved shirts will protect your skin from pests and will keep you warm if the temperatures dip at night. You also want to pack extra socks and underwear. Take sturdy hiking boots along, too. Rain gear like a poncho can be used as shelter in a pinch. Bring a hat along to keep the rain and the sun off your head. Take sunglasses to protect your eyes in case you are out in the sun for long periods. A bandana – or several bandanas – should be packed because they have a multitude of uses. Shelter materials should also go in your backpack. Take a tent or a tarp along with cording in the event you need to tie something to trees. Carry a sleeping bag or a sleeping pad along to protect you from having to sleep directly on the ground. Make sure there are enough emergency blankets for everyone. Personal hygiene materials need to go in your bug out bag and don’t forget your first aid kit. Include all medicine anyone in your family is on. Fire starters are necessary as are waterproof matches. Take a flashlight that uses solar power rather than batteries. You also want fishing gear, a knife and a multitool. An emergency radio and a way to charge your cell phone using solar power should be included in your bug out bag. Have sturdy gloves and a small axe that can be used to make a clearing or to get debris out of your way. You also want to have a folding shovel and duct tape. Bring your important papers and pack card games, coloring books or some type of entertainment for the kids. Finally, make sure that you bring a weapon such as a gun in order to protect yourself and your family. 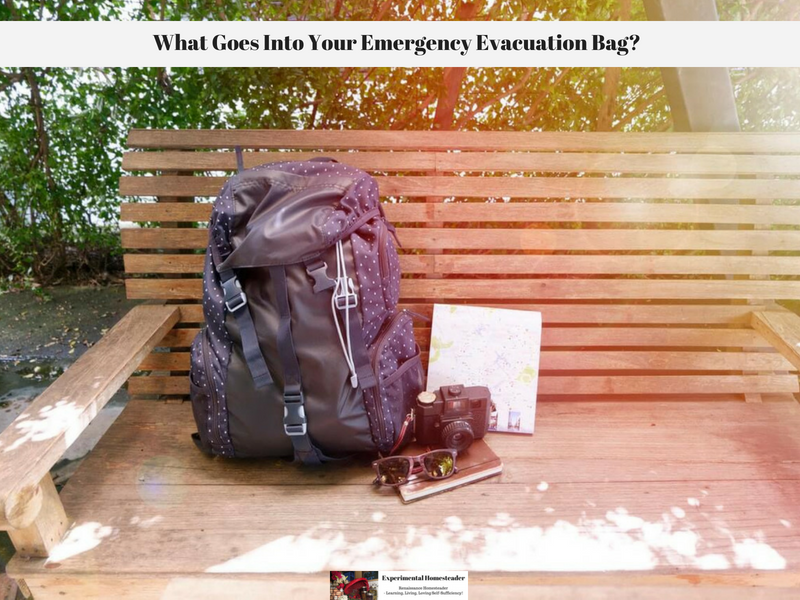 By having your emergency evacuation bag packed and ready to go, you save time plus eliminate the possibility that you are going to forget something important. If possible keep your emergency evacuation bag within reach at all times because you never know when you might have to bug out. Previous Post: « Gourmet Eating On A Dime With Ingredients From Your Own Cabinet!